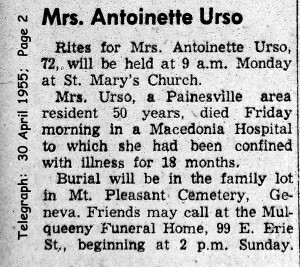 Antonia Pusateri first appears in the Painesville, Ohio, area about 1903. 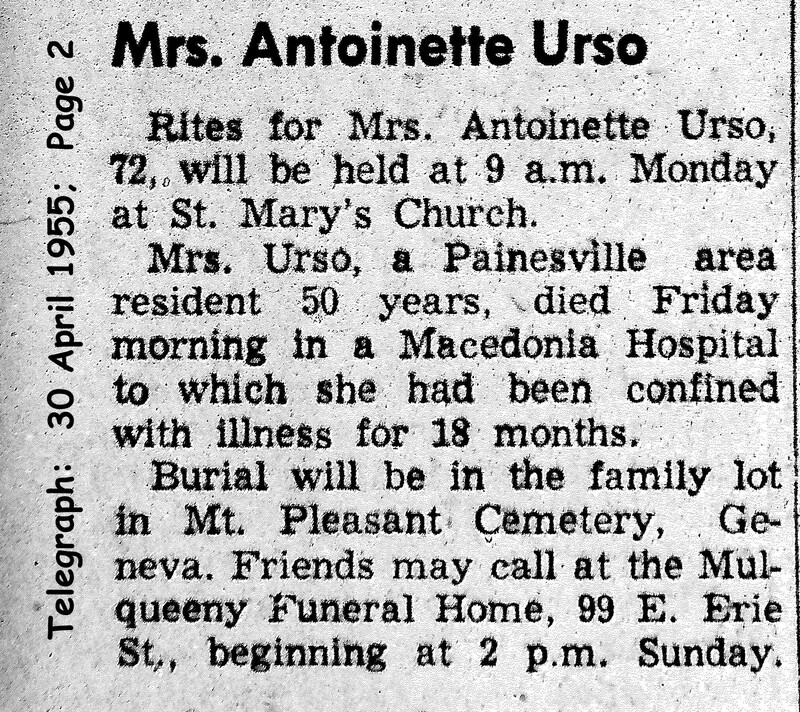 In America, Antonia Pusateri was known by her married name, Antoinette Urso. Antonia Pusateri, daughter of Antonio Pusateri and Francesca Schiavo, was born about 1882, at Termini Imerese, Sicily. She married Luciano Urso, son of Salvatore Urso and Maria Sampson, about 1900 in Sicily. 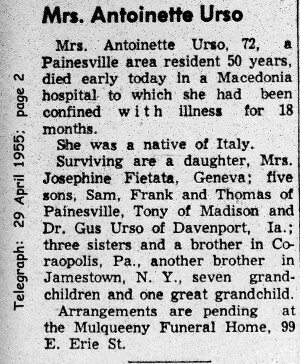 Antonia died on April 29, 1955, at a hospital, Macedonia, Summit County, Ohio. Her body was interred at Mount Pleasant Cemetery at Geneva, Ashtabula County, Ohio. 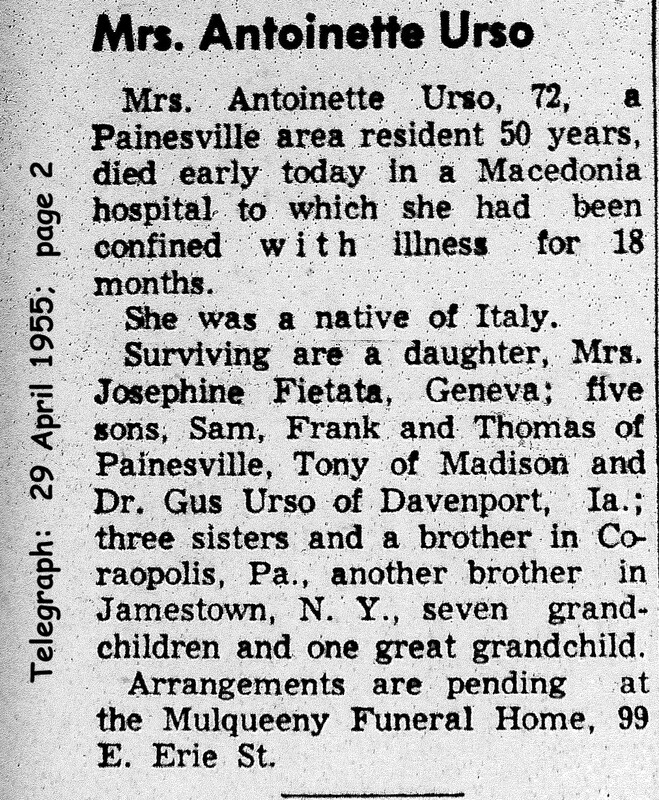 Antonia Pusateri immigrated to the United States on October 22, 1902, at age 20, travelling to Coraopolis, Pennsylvania. She immigrated with her husband, mother, and two siblings. They were joining his Antonia’s father, Antonio Pusateri, in Coraopolis. Antonia was widowed in 1915 at age 33. In 1915 Antonia was left to raise five children ranging in age from 11 years to 8 months.